Gujarat, the state which pioneered the concept of the Special Investment Region, will establish 12 new industrial hubs in the next 5-6 years and expects the private sector to play a leading role in facilitating the process. "We have 12 more such projects in the pipeline, including four which have already been notified by the government. 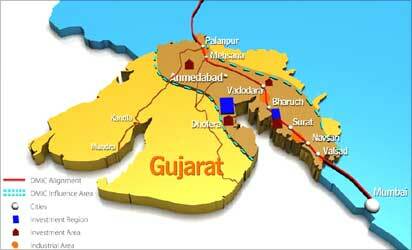 They will all be operational by 2015-16," a senior official of the Gujarat Industrial Development Corporation said. 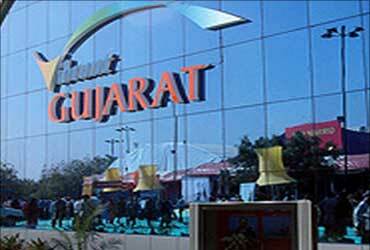 Gujarat passed an act for the SIRs and set up the first such hub -- Petroleum Chemical and Petrochemical Investment Region (PCPIR) spread across 453,000 square hectares -- in Bharuch last year. 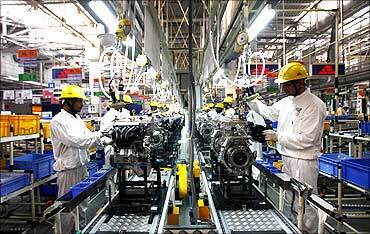 The state government now plans to set up the SIRs to act as industrial hubs for various sectors including auto ancillaries, chemicals, healthcare, electronics and so on. 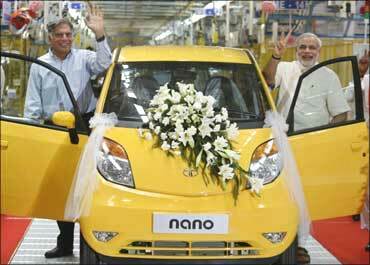 Image: Tata Group chairman Ratan Tata (L) with Gujarat Chief Minister Narendra Modi. Investment worth over Rs 70,000 crore (Rs 700 billion) has already gone into PCPIR and the official said similar expenditure is likely to be incurred in other SIRs as well. ONGC Petro Additions Ltd is the anchor tenant or major investor in the PCPIR and has put in around Rs 19,000 crore (Rs 190 billion) into the project. "We are looking at similar participation by the private sector in the upcoming SIRs also," the official said. Of the new dozen SIRs, 10 would be built by the GDIC, a PSU under the state government, while the rest two are being built by the Gujarat Infrastructure Development Board and the Gujarat Maritime Board. SIRs are special regions spread over a minimum 50,000 hectares where industries can buy lands directly from local owners. However, they are not offered concessions like tax benefits as in SEZs. "However, the main benefit of SIRs is that they provide quality infrastructure and development even before units become operational. In every SIR, 55 per cent area is to be set aside for residential townships and other non-processing units," the official said. SIRs are regulated by Regional Development Authorities which plan, regulate and develop the zones. Santalpur SIR of 186,000 hectares (which will focus on agro industries and solar energy), Halol Savli SIR of 122,000 hectare (auto ancillaries and electronics) and Viramgam-Sanand SIR of 138,000 hectares (auto, engineering and healthcare) are among upcoming SIRs in the state over next 5-6 years. "Even a small SIR like the one being built by GIDB at Dholera is of 50,000 hectares, much larger than the world's largest SEZ in Shenzhen (China) which is of 32,700 hectares," the official said. Work on Rs 1,100 crore (Rs 11 billion) first phase of the metro rail project in Ahmedabad-Gandhinagar will start by next year and the line is expected to be operational within 2-3 years, Gujarat Infrastructure Development Board (GIDB) CEO said on Thursday. "A company has been set up for undertaking the metro project, MetroLink Express Ahmedabad Gandhinagar and a newly appointed managing director would join later this month. 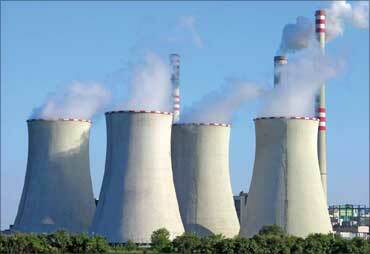 Work on the first phase of the project would start in the middle of 2011," said GIDB chief executive officer A K Sharma. He, however, did not reveal the name of the managing director. The first phase of the metro rail project will cover a distance of 32.65 kilometre in the north-south direction between Gandhinagar and Ahmedabad and 10.90 kilometre east-west corridor between Kalupur and Thaltej. The GIDB CEO said that though no official time frame has yet been formally announced for completion of the first phase, the metro service is likely to be operational within 2-3 years. Sharma, who is also secretary to the state's Chief Minister Narendra Modi, added that the metro line in its second phase will connect Ahmedabad with Dholera, the site of a Special Investment Region. This will add another 125 kilometre to the north-south line. "However, details for the second phase are still to be worked out. First of all, we want to get ahead with the first phase of the project so as to provide world class connectivity to the people in Ahmedabad and Gandhinagar," he said. Sharma said the state government was in talks with private sector players to involve them in the metro rail project.